Today, I want to present a very bad news. Ma Long has withdrawn from the Men’s World Cup Table Tennis, which will be organized in Paris this October. It’s very rare in table tennis history, that a player quit a long time planned tournament. The Men’s World Cup Table Tennis will be organized at Disneyland Paris (77777 Marne-la-Vallée, France). The event occurs from 19th to 21st October 2018. The 2018 LIEBHERR Men’s World Cup take place in France, in one of the most sightseeing place in Europe : Disneyland® Paris. From 19th to 21th october 2018, 20 of the best players in the world will face in the fairy scenery of the Disney® Events Arena for a 3 days show. World Cup is one of the most prestigious tournaments in table tennis. By not playing this tournament, the world ranking of Ma Long on the “unfair” ITTF World Ranking will even drop more. And this will affect the desire of the Olympics Tokyo 2020 of Ma Long. ITTF has announced the confirmed players for the World Cup, and there is no Ma Long. Instead, Lin Gaoyuan will replace Ma Long. Some players asked why Lin Gaoyuan, his performance is not very stable. Well, because he is the 2nd position in the Asian Cup. China always wins the World Cup from 2010 to 2016. However, last year, there was a big upset, that Timo Boll has beaten all of the top Chinese players in the Quarter, and Semi-Final. But the real reason behind is not his age. Many coaches and players in China know the reason behind this. Some players say that it due to Ma Long’s performance. At the present, Ma Long is not in a good shape. He lost to Harimoto at the Quater Final in Japan Open this June 2018. Ma Long lost to Liam in the Bulgarian Open at the first round. However, now we are in August. There are still 2 months ahead. The world cup happens in October. And 2 month is a lot for Ma Long to recover. Or he just wants to sacrifice for his family? The prize Men’s World Cup 2018 is $ 60,000, the champion will be added in 2550, the runner will get 2295 points, more than 4 times the ITTF World Tour Platinum (500 points for the winner). It’s very important if Ma Long wants to get the point to participate in the Olympics Tokyo 2020. So the real reason is “the unfair World Ranking system”. The current world ranking is not accurate, and it makes the player feel unfair. Why? There are 2 bad things about the new system. First, the new system obliges the player to participate in at least 8 ITTF tournaments. who do not participate in the 8 ITTFs will affect the ITTF rankings. Especially the athletes who are the real top player but older and will not be physically fit to participate in all of the events. Second. The new scoring method makes cumulative point large, which makes chasing the score extremely difficult. Moreover, the new system is very unfair: You won’t lose the point if you lose, only winning count. So the higher rank player just abuses, and participate as many tournaments as possible, and don’t worry when loosing to the lower rank player. So that’s why the current ranking system is unfair. That they take the quantity over the quality of the match. The true top players now have a very low World Ranking. While the average players increase their ranking. Speaking outrage, the best players, the World Grandslam are dropped out of the top 10 World Ranking ITTFs in early 2018. Meanwhile, when you win some Platinum ITTF World Tour, and you can reach the top ranking. This unfair system makes that the huge event, the most prestigious event, not as important as before anymore. You can only find the “big name”, the best players in the most important event. But now, the “big name”doesn’t bother to participate. Because they feel “unfair” to this system. So again, nowadays, the Quality is dead. But it’s the Quantity who counts. What do you prefer? Quantity or Quality of a match? But you know, as a table tennis player, and a table tennis coach, someday, you will feel “tired” about this. 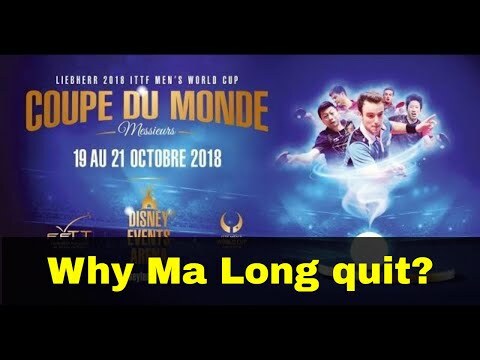 Why Ma Long withdrawn World Cup 2018? its too bad that Ma Long wont play in Paris next month. I have bought the ticket to the event.